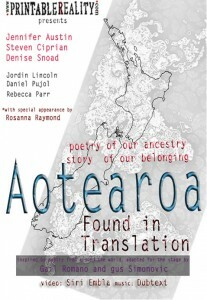 “Aotearoa – Found in Translation” is a contemporary performance/live literature project that celebrates the modern day Kiwi culture and all the elements that it has been made of. Inspired by the poetry from around the world, adapted for the stage and directed by Gus Simonovic and Gail Romano. Music by Dubtext and video material by Siri Embla. Printable Reality Actors Ensemble brings to life a contemporary performance/live literature project exploring the experience of becoming a New Zealander. Inspired by poetry from New Zealand and around the world, adapted for the stage and directed by gus Simonovic and Gail Romano – Aotearoa is a cloud in motion, a place of becoming, where our personal journeys are at the centre of the story. Multicultural society is our reality. New Zealand is a country of immigrants, a modern nation built on diversity. Historically, all New Zealanders have come from somewhere, some before some after. They have all bought parts of their tradition, language and culture – threads from which the tapestry of our modern day Kiwi-culture is woven. Over the past four months, favourite poems from all around the world were collected by various NZ communities, individuals and poets. In adopting and adapting them for this performance, parts of those poems are “lost in translation”, leaving behind the old homeland, and parts have been “found in translation” – finding a new home and contributing to the new culture. The resulting collection of poems and excerpts is transformed into a 40-minute spoken word performance complemented by sound and images. The project aims to use language and poetry to deepen the understanding of where we “come from,” individually and collectively, and what makes us who we are today. As a starting point for this project 10-12 poems, from different parts of the world, will be selected (with help from members of Auckland’s Multicultural society or/and other friends and poets with variety of ethnic backgrounds ). Poems will be chosen to best represent the cultural tradition and the language that they originate in. Research and selection process will aim to collect work from different cultures that features a certain concrete element and a “feel” of the place. Not as much to “represent the country”, but convey delicate aspects, properties and qualities of certain area, ethnic group and people(s) that “brought it” to Aotearoa. Inspiring and transformational, this is a live poetry show like you have never seen it before.